From downloads to ringtones, Xboxes and video games to film, television and new media, music is an integral part of billions of listeners’ lives worldwide. It All Begins with the Music: Developing Successful Artists and Careers for the New Music Business offers practical information, career blueprints, and a world of wisdom for aspiring artists, songwriters, music publishers, managers, executives and entrepreneurs on how to make an impact in today's music business. Across an impressive span of 80+ exclusive interviews, co-authors Don Grierson and Dan Kimpel introduce a stellar cast of diverse music biz luminaries. While traditional artists and executives are represented by such marquee names as Joe Cocker, KISS, Heart’s Ann and Nancy Wilson, and industry heavyweights like artist manager Jim Guerinot (No Doubt, Gwen Stefani, Nine Inch Nails, The Offspring) and Sony Records Nashville president Joe Galante (Carrie Underwood, Kenny Chesney), the scales are balanced by the soon-to-be known names of the future: new artists, as well as a new generation of risk-takers and visionaries from all the various areas of the complex music business, reshaping what is to be. Distinguishing the indelible line between creativity and a higher power is an undertaking with deep implications. Whether it is defined as coming from God, the universe, or some collective font of eternal knowledge, most creative individuals acknowledge that at times their inspiration seems to emanate from a mysterious metaphysical source. Songs affect people’s lives on a profound level, and songwriters – including interviewees Melissa Etheridge, Paul Williams and Beth Nielsen Chapman -- are especially attuned to these principles. 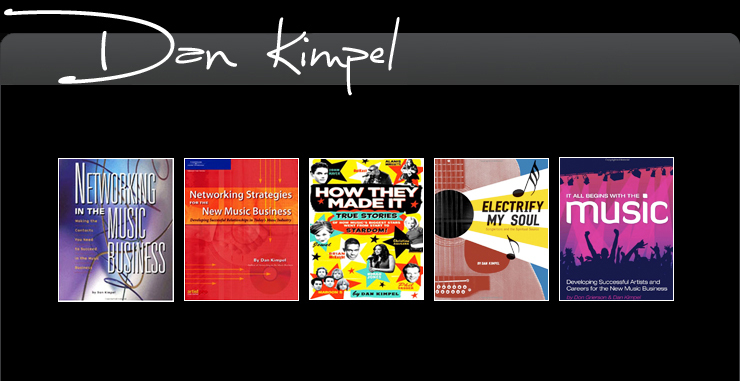 Author Dan Kimpel -- who has interviewed virtually every major songwriter in the history of American popular music -- has observed that many successful songwriters -- are often able to tap their spirituality for inspiration. Electrify My Soul: Songwriters and the Spiritual Source explains these processes as it tells their stories. Everyone comes from somewhere: How They Made It is a savvy insider's tale that traces the career trajectories of a cross section of top selling recording artists, punctures the mythologies of the music business, and reveals the truths within. Geared for those trying to make it in the music business * Artists covered include Alanis Morissette, Green Day, John Mayer, Norah Jones, Jim Brickman, Death Cab for Cutie, OutKast and Rufus Wainwright * Author is well-known writer for Music Connection magazine, the best source for music business news published from Los Angeles. If the philosophy 'Who you know, what you know, and who knows you' can ever be considered true, it's in the music business. Every deal that goes down in the music business is almost always a direct result of a personal contact. From the well-known author of the very successful Networking in the Music Business, this book acts as a guide to making your personal strengths and relationships with others work for you in this unique industry. You'll learn the importance of connecting to others who share your aspirations, energies, and enthusiasm. You'll understand how to strategize your way to a successful career through personal relationships. Whether you're a professional or an aspirant in the music business -- a songwriter, recording artist, musician, composer, music editor, music educator, music publisher, DJ, publicist, PR expert, entertainment lawyer -- or if you plan on working with any of the above, this book is your key to developing the people skills necessary to achieve success in this billion dollar global industry.